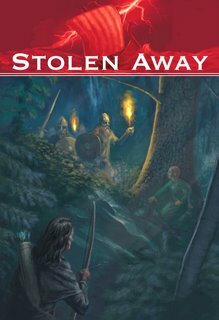 Come to Chapters Newmarket on November 15th and help Mr. Dinsdale launch his brand new novel Stolen Away! This is Christopher Dinsdale’s second historical action adventure novel with Napoleon Publishing. It follows on the success of his first award-winning novel 'Broken Circle'. When purchasing this novel, you will also be supporting Clearmeadow Public School. 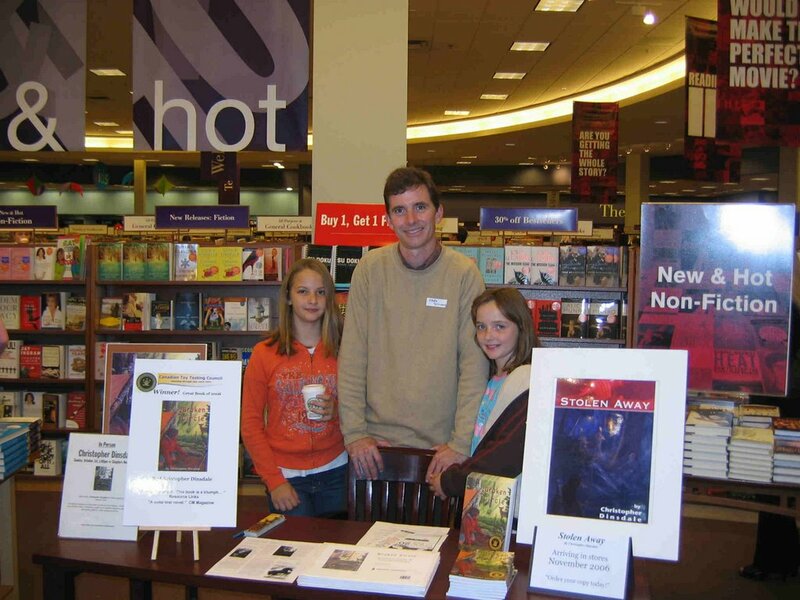 Chapters Newmarket has agreed to give 10% of all sales of 'Stolen Away' to Clearmeadow Public School. On this special day, they have also agreed to give Clearmeadow 10% off all other regular-priced merchandise as well! Napoleon author Heather Kirk will be signing copies of her book about Mazo de la Roche at Benares Historic House in Mississauga on Sunday December 17, 2006 from 1 to 4 p.m.
College in Barrie, Ontario on Saturday September 29, 2006.
on Monday evenings from October 16 to December 4, 2006. 15, 2006 at 8 p.m. 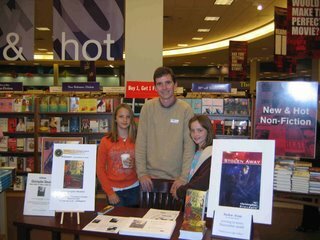 Here is a photo from Chris Dinsdale's Teacher Appreciation Day signing at the Chapters store in Newmarket, Ontario, October 1st, 2006. Books were sold to teachers visiting from as far away as the Bruce Peninsula and Midland, many of whom had heard what a terrific classroom resource "Broken Circle" and its teacher's guide are. The word is out! Chapters Newmarket will also be hosting the launch of Chris' latest Napoleon novel, "Stolen Away", in November. Stay tuned to this space for further details. Napoleon Publishing author Joanna Emery will be presenting her book, "Caring For A Colony: The Story of Jeanne Mance" throughout the day at the 16th Annual Heritage Book Fair -to be held on Saturday, November 18th, 2006, 9:30am to 3:00pm, St. James United Church, 306 Parkside Drive, Waterdown.